These instructions are for new installs of Presto 8.0 (and higher) only. If you are upgrading Presto from an earlier release, please log into myFreschesolutions.com to view the Upgrader's Guide. For additional product information, please visit the Presto home page. Step 1: Download Presto and Transfer the IBM i Install Files. Follow these steps to download the installation files and transfer the server component to your IBM i. You can download Presto from myFreschesolutions.com. If you don't have a portal profile yet, contact our Sales office or fill out the Presto Trial Request form to receive download instructions and a trial period license key. Download the server and PC installation files and save them to your PC. ?When the download is finished, double-click the IBM i install executable file prestoserver-7.x.exe [the exact version may vary] to unpack the files and transfer them to your IBM i.
Click the Upload button in the lower left hand corner. ?When the upload finishes the activity log displays the message 'File upload complete'. 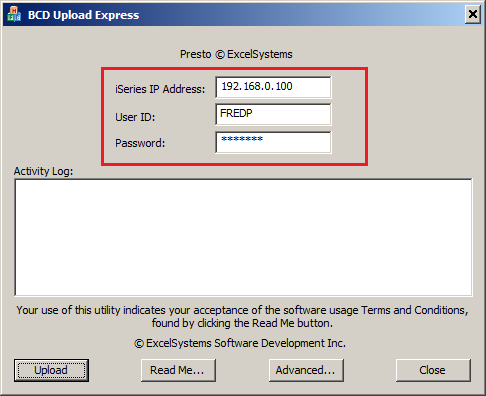 You can then close the BCD Upload Express window and continue with the next step.